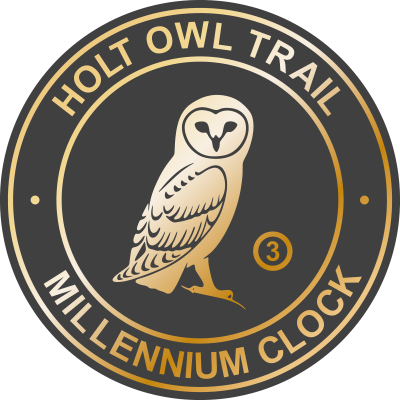 Erected and unveiled in the year 2000 this clock symbolises the merger of two of Holt’s biggest retail businesses. 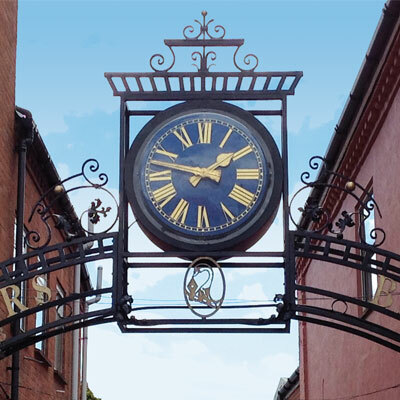 In 1977 the famous ironmongery and builders’ merchant C. T. Baker Limited purchased the premises next door, trading as Larner Brothers Ltd, a highly specialist grocery and fine wine retailer. 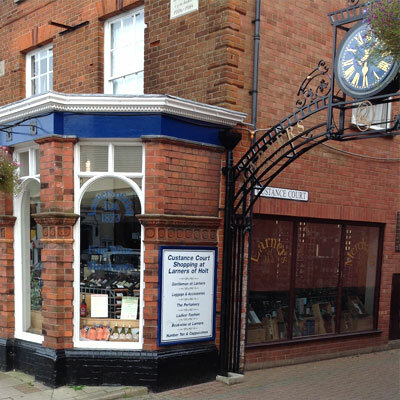 Bakers and Larners is now the largest retailer and employer in Holt town centre. Their premises at No 8 Market Place were built in 1631 and a 2000 square feet wine cellar lies beneath the Larners building. Where the Trail continues on the South side of the town centre there are many fine examples of Grade II Listed Georgian buildings that line the opposite side of the Market Place. A desirable feature of Georgian architecture and town planning was to ensure symmetry, proportion and balance. Simple mathematical ratios were applied to determine the height of a window in relation to its width.